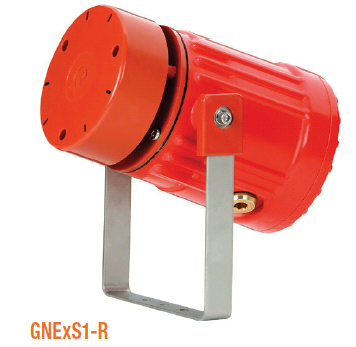 The GNExS1 alarm Explosion Proof Sounders are suitable for Zone 1 & Zone 2 applications – certified to ATEX and IECEx. Sound level ouputs are up to 117dB(A) at 1 metre with a choice of 64 alarm tones and 4 remotely selectable stages. The alarm tone frequencies for the first 2 stages are independently selectable. 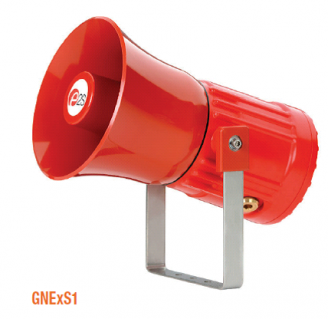 The GNEx range features enclosures manufactured from GRP (glass reinforced polyester), moulded in natural red, but also available in other colours. The re-entrant flare horn is high impact, fire retardant ABS. All models have two M20 cable entries, large termination areas containing in & out terminals and an ingress protection of IP66/67. The AC voltage model has a range of 100-260vac & dc – suitable for 110Vdc gas detection systems. – Electronic sounder up to 117dB. – Available with flare or omni-directional radial horn. – 64 tones, including ISO tones to Australian Standards. – Sound Output: Max: 117dB @ 1m (flare horn), 115dB @ 1m (radial horn); Nominal: 110-72dB with volume control. – Sound Frequency: 64 tones (see tones table in attached pdf). – Temp Rating (degrees Celsius): T4 -50 to +50. – Construction: UV stable GRP housing, stainless steel mounting bracket, ABS flare. – Approval: II 2G Ex d IIC T4 (max ambient temperature +50 degrees Celsius), II 2G Ex d IIC T3 (max ambient temperature +70 degrees Celsius), II 2G Ex d IIB T6 (max ambient temperature +70 degrees Celsius). – Certificate: IECEx SIR 13.0029X. – Weight: DC – 3.35kg, AC – 3.55kg.